I would like to start with the day I stepped foot into this amazing and royal ground!. About Udaipur, places to visit in Udaipur are plenty, and it was just a two-day's Udaipur trip but trust me I explored as much as I could. I reached Udaipur early in the morning by around 7:30 am and I saw the chauffeur waiting to drive me to the hotel. I already booked the hotel with the help of "Padharo Udaipur" app to save time and money (as it provides cheap deals).During my Udaipur trip, the first destination as described was the hotel i.e. "Amantra Comfort Hotel", the hotel is situated at the Saheli Marg area from which a beautiful property is nearby namely "Saheliyon Ki Badi" (a garden built for the daughter of the Maharaja to spend time with her elite friends) one of the beautiful places to visit in Udaipur. I relaxed at the hotel for some time and then moved with my backpack to explore the city! The first spot I scheduled for the places to visit in udaipur was "Fateh-Sagar Lake" which is quite near to the place I was staying. The lake is named after Maharana Fateh Singh of Mewar. It is basically an artificial lake and one of famous tourist places in Udaipur. If you have prepared the list of places to visit in Udaipur and wondering on the mode of transportation I suggest to get an auto; you have to be good at bargaining as the auto guys charges a lot from the tourists. You can even ask help from some locals for more discounts. After spending some time at the lake I went to the "Monsoon Palace" better known as Sajjangarh by the locals. The fort is situated on the hill and the view from there was truly mesmerizing in the Udaipur trip, all covered from clouds! I enjoyed a lot there and clicked some cool stuff to make my friends jealous. After visiting the property I walked off from there and went for some shopping. I searched the markets on the App described above and as recommended by the app I went to Jagdish Chowk (a local market) to grab some traditional stuff. I bought a bag full of mojris (leather footwear) and leather diaries. I even grabbed 2-3 colorful Ghagra (long skirt) and printed scarves. Again the shopkeepers will demand a lot of price for the things but you should be aware of the local reasonable rates before buying. You can search for forex from the app if you get out of money. It was almost late evening by the time I finished shopping. So, then I went to have dinner at "Ambrai Restaurant" situated by the lake side of Pichola Lake. Trust me I lost my appetite after watching the view of the lake from there. It was so beautiful that I couldn't leave that place for above an hour, the fort in the front and the shining golden Gangaur Ghat gates were truly worth watching! So, here is the end of day 1. The second day in Udaipur trip I was just able to visit The City Palace as I had my flight in the evening. The City Palace is the property worth exploring and knowing about the hidden stories of the Mewar Ancestors. I hired a guide from padharo so that I don't miss anything to see. Allow yourself the maximum time to see learn about the palace. It is well maintained and the peacock courtyard is stunning. My Udaipur trip was for a span of time, but trust me I don't regret anything out there. Places to visit in Udaipur are plenty and every spot is worth watching as each of them had its own hidden stories carved into the walls of the city. 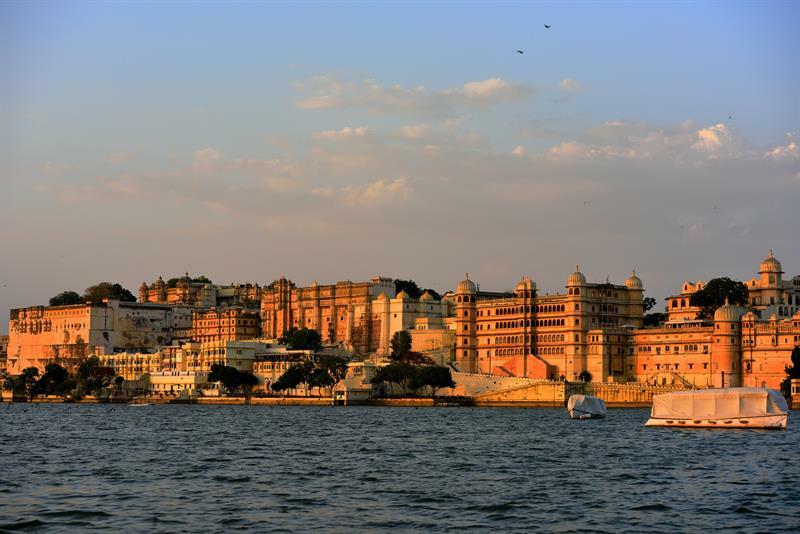 Udaipur is considered as the best tourist destination in India. Apart from the breathtaking views of Lake Pichola & marvelous monuments, this beautiful city is also world famous for hosting many big fat royal weddings; marking itself as the world's best wedding destination.